It’s now easier than ever to handle ‘change drop-off’ requests from passengers! At Grab, we strive for each and every journey to be as seamless as possible for our Driver-Partners. However, confusion and uncertainty may arise when passengers need to make an urgent or last minute change to their destination. That’s why from 8 October 2018 onwards*, passengers will be able to change their drop-off point within their own Grab app. When this happens, your Grab Driver app will update** to show the new destination, the fixed fare for the total distance travelled, as well as a ‘Change Drop-Off’ surcharge (added automatically). This helps ensure that you’re paid fairly and accurately for your entire driving journey. Therefore, do not enter an additional SGD 5 surcharge at the end of the trip. This helps ensure that you’re paid fairly and accurately for your entire driving journey. Note that the surcharge is only applicable to fixed fare jobs, and the surcharge amount will differ for different services. *The feature is currently under pilot testing, and will be available to all passengers by end-October. **For Partners on third-party navigation apps (Google Maps, Waze, etc. ), you will receive a pop-up (Android) or push notification (iOS) alert when the destination changes. Please tap on the Navigate button again to route to the correct drop-off point. Q: How does Grab calculate the fare when a passenger changes his/her destination? Q: Do I still need to add the additional SGD 5 surcharge at the end of the trip for? A: No, as it will be added automatically to the final fare! Q: How many times can a passenger change his/her destination? A: Passenger can only change their destination once per trip. Q: For GrabShare rides and My Destination jobs, can passengers change their destination? A: No, passengers will not be able to change their destination for GrabShare rides and My Destination jobs. Q: Can the passenger change his/her drop-off point after I’ve accepted a Back-to-Back (B2B) job? A: No, passengers will not be able to change their destination after you’ve accepted a back-to-back (B2B) job. Q: If I’m on a third-party navigation app (e.g. Google Maps, Waze), will I be notified if the passenger changes his/her destination? A: Yes. Android users will receive a pop-up alert, while iOS users will receive a push notification. Tap on the message to return to the Grab Driver app, and then tap on the Navigate button to route to the correct drop-off point. 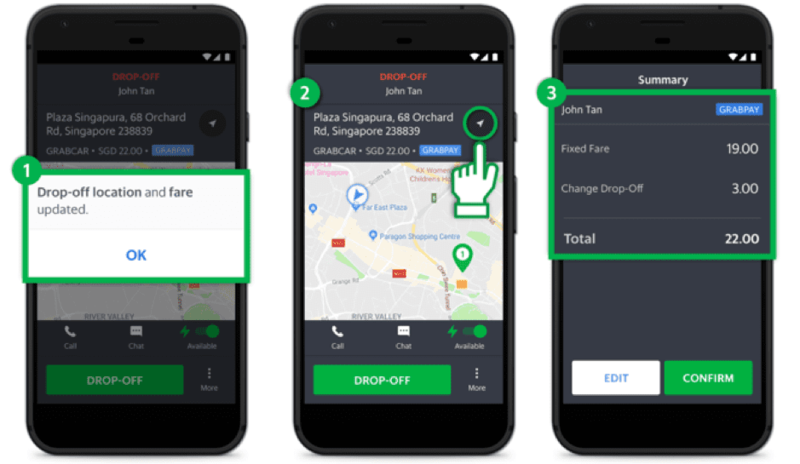 Q: Does Grab collect commission from the ‘Change Drop-Off’ surcharge? A: Yes. Since the ‘Change Drop-Off’ surcharge is part of the fare, Grab will collect a commission from this. Q: Who pays for this surcharge? A: Passengers will pay for the surcharge.